Wednesday October 17th 1900 I feel much better this morning. I helped with the work and did a little sewing. I was up to Aunt Ellens in the afternoon and took Orine with me. I sewed in the evening Leonard began to crib corn today. 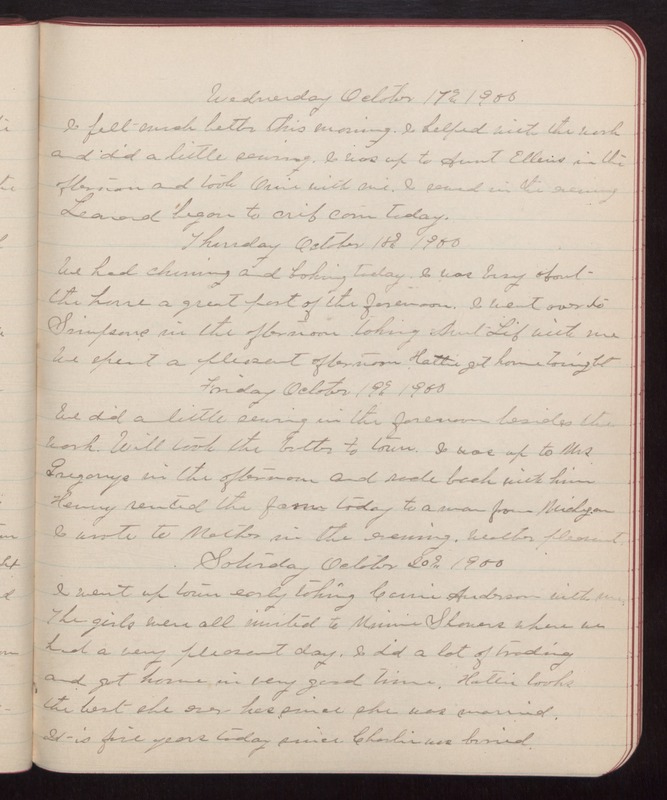 Thursday October 18th 1900 We had churning and baking today. I was busy about the house a great part of the forenoon. I went over to Simpsons in the afternoon taking Aunt Lib with me We spent a pleasant afternoon. Hattie got home tonight Friday October 19th 1900 We did a little sewing in the forenoon besides the work. Will took the butter to town. I was up to Mrs Gregorys in the afternoon and rode back with him Henry rented the farm today to a man from Michigan I wrote to Mother in the evening. Weather pleasant. Saturday October 20th 1900 I went up town early taking Carrie Anderson with me. The girls were all invited to Minnie Showers where we had a very pleasant day. I did a lot of trading and got home in very good time. Hattie looks the best she ever has since she was married. It is five years today since Charlie was buried.